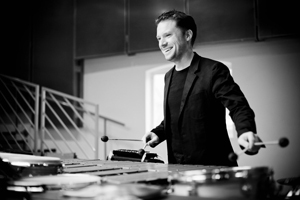 Hailed as “the world’s finest and most daring percussionist” Colin Currie is a solo and chamber artist at the peak of his powers, acclaimed for his virtuosity and musical integrity. Championing new music at the highest level, Currie is soloist with the world's leading orchestras, including the Philharmonia, Rotterdam Philharmonic, Philadelphia, Cleveland and London Philharmonic orchestras. Currie has forged a pioneering path in creating new music for percussion, premiering works by Reich, Carter, Andriessen, HK Gruber, MacMillan, Clyne, Rautavaara, Ross Edwards, Higdon, Aho, Wallin, Schwertsik, Holt, Goehr, Norman, Maric, Julia Wolfe and Nico Muhly. Currie’s unrivalled commitment to commissioning and creating new music was recognised in 2015 by the Royal Philharmonic Society who awarded him the Instrumentalist Award. He is Artist in Association at London’s Southbank Centre, where in 2014 he was the focus of a major festival, “Metal, Wood, Skin”, featuring a number of premieres and performances. Currie is also Artist in Residence with Oregon Symphony Orchestra 2015/16–2017/18. He also performs widely with his critically acclaimed Colin Currie Group, formed in 2006, specialising in the music of Steve Reich. Currie has recorded many concerto, recital and chamber works; his recording of Rautavaara's Incantations with the Helsinki Philharmonic/Storgårds (Ondine) was released to critical acclaim and won a 2012 Gramophone Award. Elliott Carter's Two controversies and a Conversation came into being as the result of a suggestion by Currie of a work for these forces by the composer. Currie felt that it would tickle Carter's imagination and enduringly inventive spirit, which indeed it did. The two met for the first time in 2010 in New York City, and collaborated closely on how the percussion writing could work.